There are almost thirty farmhouse retains the original state of the manor. Visitors can found here the only lake aquarium, which presents the flora and fauna of the Balaton. Inhabitants have lived in the town since the Avar age. The people who settled here main occupation was agriculture, complemented by crafts. The settlement was first mentioned in 1055 in Tihanys deed of foundation. In it stands, that I. Andrew founded the Abbey of Tihany and donated this property to - among other things - the Benedictine monks. The current state of the plain shows a typical image of 150-200 years ago. The castle is one of the oldest buildings in the plain. 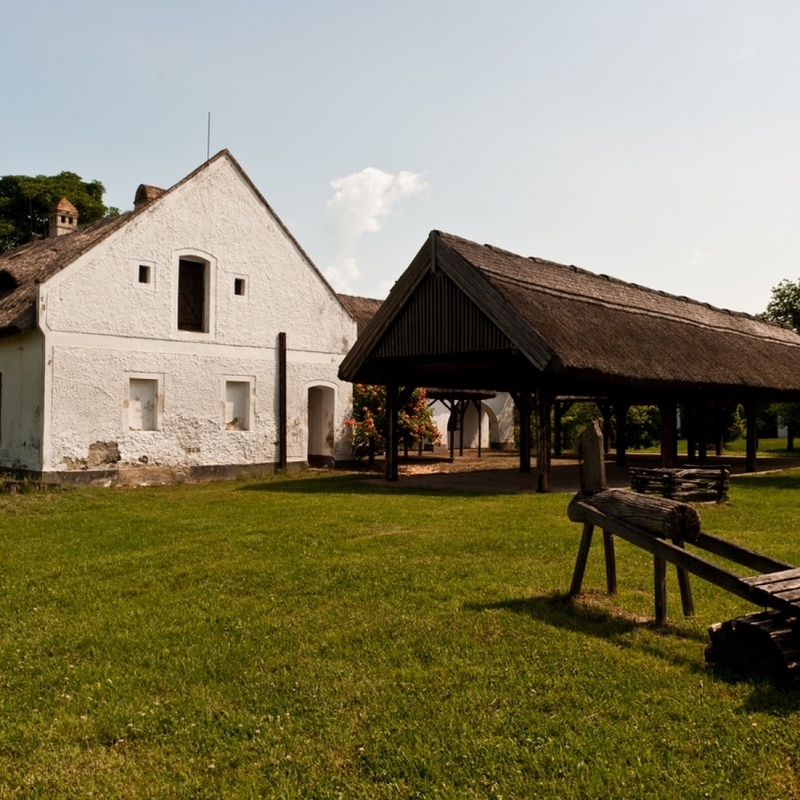 In 1716 it was already the residence of the steward, economic officers and forest engineers of the Abbey of Tihany. In the 1880 -'s when Szántódpuszta experienced the second "golden age" of its modern history, the mansion got reconstructed in neoclassic style. That is when it received the pillared porch, and the reminiscent facade which remind us of the rural aristocratic mansions. Today in the building operates the office; and the other rooms give place for the different permanent and temporary exhibitions. Cob houses from the earlier times wew replaced with houses, barns and granaries made of brick. The Europa Nostra Award-winning building complex from the 18' th - 19'th century is a cultural centre now. In Szántódpuszta you can see the aquarium with different kinds of fish from the Lake Balaton. This aquarium is unique in the region. One wing of the wine cellars forefront is today functions as a tavern. In the cellar, walking among the huge barrels the man can almost be lost. The huge, beautifully arched brick domes, carefully masonry vaults provide the sight of a beautiful work of architecture even for non-expert viewers. These days called Adam Pince awaits guests who are after a long walk in the plain would like to try the cool drinks, wines from the lakes region, good coffee and a variety of Hungarian specialties in a cozy candle-light. The adventurous can try out our new game, the so called “Puszta golf”. Is to be a wooden slippered bat and a handball-sized leather ball, the aim is to keep hitting the ball from hole to hole, all in a picturesque pasture.